Well, it had to be done. I have, this week, started to read Dante. Not in the original, of course – I am a very poor linguist – but in Robin Kirkpatrick’s translations, which come with detailed introductions and copious commentaries and notes, invaluable for someone like myself, shamefully ignorant as I am both of the historical and the cultural context of the Commedia. And it is a dual language edition, so I can, at least from time to time, glance across to the Italian text to get at least a feel of what the original sounds like. So why Dante? Well, life is too short for anything but the best. And how do I know this ranks among the best? Well, I don’t, of course. But given that one cannot check everything out for one’s own self, one has to rely to a great extent on the judgement of others – one has to go by reputation. Which is not to say that one abnegates one’s own judgement, of course; but one’s judgement can only be applied to what one has already read, and, except in the obvious cases of twaddle that are recognisable from a mere extract or two, this judgement doesn’t take one very far in deciding what to read next from that vast and as yet unknown ocean of literature. One has little choice but to rely on reputation. In a recent post, I suggested that the four most significant pillars of Western literature are Homer, Dante, Cervantes and Shakespeare. This is contentious, of course – not for what has been included, but for what has been left out: what about the Greek tragedians, one may ask? Or the Romans? And why stop at the early 18th century? – why not move on to Goethe and Heine and Pushkin, or to Tolstoy and Dostoyevsky, or on into modernism? Indeed. This is why trying to compile lists of these things, or attempting to define the criteria of inclusion into a literary canon, is such a fruitless activity. But however we define the literary canon, there is no-one whose place in it is more secure than Dante’s. To anyone with an interest in literature, this is a peak that just has to be scaled. But approaching something such as the Commedia leads to a somewhat awkward question: how should we, in our secular and disbelieving age, approach religious literature? And religious art as well, for that matter. And religious music. Of course, I do not mean to suggest that one has to have religious belief to appreciate or even love works with religious content: it should come as no surprise, for instance, to see Richard Dawkins choose Bach’s St Matthew Passion amongst his Desert Island Discs. But the question still remains: do we secularists appreciate such works despite their religious content? Or could it be that, despite our professed disbelief, we love these works because of it? I find this an endlessly fascinating question, and I fear there is no way to discuss this question without at least touching on that awkward and potentially embarrassing issue of one’s own religious beliefs, or lack of them. I would prefer not to go into this too deeply here, firstly because I am not at all learned in matters of theology, and secondly because it is an extremely contentious area, and whatever personal view I put forward, I am bound to anger and even alienate at least some of my readers. But if I am to write about literature (which is after all the primary purpose of this blog), then it’s hard to see how I can escape writing about religious literature; and if I am to write about religious literature, my own religious (or irreligious) outlook is far from irrelevant. So, with apologies beforehand to anyone whom I might offend, I might as well take a deep breath and dive in: how do I, who profess no particular religious belief and who usually write “None” when asked to specify my religion on an official form, approach a work as the Commedia which is entirely imbued with Christian thought? Is it possible to take anything at all from the Commedia without, at the very least, a leap of the imagination into this world? And can one be capable of such a leap without having, at the very least, some sort of sympathy with religious belief? Before we dive into discussion of such matters, we should, I think, acknowledge that the extreme poles of devout belief and of unconditional disbelief are but that – poles; and that, between these poles, there are almost infinite shades of grey, almost infinite nuances. The very presence of these nuances is often denied by the Dawkinsites, who appear to insist that either one believes or one doesn’t, and that there can be no room for “I don’t believe but…”. I think this is the first of many points where I part company with the Dawkinsites: far from dismissing this but as intellectual pusillanimity, as they appear to do, it is in this region of but that we find depth and richness: but for this but, our lives, beset as they would be with immutable certainties, would, to my mind, be arid indeed. It is in this region of but that the human imagination, without which there can be no art or music or literature – or even, for that matter, science – flourishes. Far from dismissing this but, let us welcome it, and look into it a bit deeper: but what? My own first tentative steps into this region of but are motivated by certain feelings – feelings of yearning and of awe – that I know I often have, but which I cannot articulate to any degree of precision. Vaguely defined though these feelings may be, I know I experience them when I listen to certain music, or when I read certain lines of poetry. And not just then: there are all sorts of occasions when I know I feel certain things that, for want of a better word, may be described as “transcendent”, since they appear to transcend the mere physicality of the world I inhabit. Now, it may well be that “appear” is the key word here, and that these feelings of transcendence are no more than my synapses synapsing and my neurons doing whatever it is neurons are supposed to do. Yes, perhaps. But do I want to see myself as no more than a collection of neurons and synapses? The answer, for all my professed rationality, is “No, I don’t”. It may well be that I am no more than the sum of my constituent physical parts, but there is a very big part of me – no doubt deeply irrational – that rebels at such an idea. The Dawkinsites will tell me to amputate away that irrational part of myself , but I cannot. And neither, frankly, do I want to. Those who demand that, out of respect for rationality, we deny ourselves these feelings, might as well demand that we deny ourselves feelings of sexual desire, which, after all, are equally irrational. Of course, some have exhorted us to do just that, but they have been no more successful than I think Dawkins & co will be in their exhortations. Irrational or not, there are some aspects of our humanity that we cannot reasonably be expected to part with; and insisting, like some modern Pentheus, that we do so , seems to me unrealistic, and possibly, as Pentheus himself found, dangerous. But at this stage, the Dawkinsite may ask: “What about the truth? Does that count for nothing?” But, in keeping with their oft-stated dictum that everything must be challenged, I think it is worth challenging, at least as an intellectual exercise, the belief (for it is no more than that) that the importance of truth overrides everything else. Can we be sure of this? What if the truth makes us unhappy? What if the truth diminishes the richness of our lives? This is not to deny the importance of the truth, but if everything should be questioned, then let us, as Ibsen did in play after play, question also the nature of truth itself, and of the human capacity to apprehend it, and also its importance when balanced against other claims. And let us not assume that we are in full possession of the truth in the first place: such an assumption is, to say the least, highly questionable. It is at this point I realise how far I am from being that sceptical, rational creature I like to imagine myself. I’m not. But it doesn’t follow that I must therefore be a credulous, superstitious fool, for, contrary to Dawkinsite doctrine, it’s not merely a case of adhering either to one pole or the other: there are many shades of grey in between, and these shades must be acknowledged. True, I’m not entirely sure on what shade of grey in this in-between I stand on: indeed, I am not even sure I stand at all – our lives are not static, and neither are our frames of mind, even from one moment to the next. It is this constant flux in the unfathomable depths of our minds that gives our lives whatever richness they have: in this sense, uncertainty is not merely to be rejected – it is to be welcomed. It is with all this in mind that I approach religious literature. For I know I am not alone in feeling as I do: all human societies, in all parts of the world and in all times, no matter how primitive or how sophisticated, have had a belief in what may be termed– once again, very vaguely, for we have no vocabulary to express these things precisely – “spiritual”, i.e. something other than the physical. This inclines me to suspect that our yearnings towards spirituality, towards transcendence, towards whatever vaguely defined term we care to use, are innate, and cannot, for all the Dawkinsite exhortations, be wished away. And neither, I think, should we wish to wish them away. Beyond this, I don’t know that I am prepared to speculate. If I were asked if I believe in a personal God, I’d answer I probably don’t – “probably”, because I don’t know what shade of grey I may be on at any given moment. But despite my agnosticism, possibly leaning towards (but no more than possibly leaning towards) atheism, I do often find in religious writing – or in religious music, or in religious art – an expression of something which I cannot adequately describe, but which I know is far from alien to my sensibilities. That towards which we yearn may well be illusory for all I know, but the yearning itself isn’t. So, when I find myself in a state of rapture when listening, say, to Beethoven’s Missa Solemnis; or when I find myself responding to the poetry of Gerard Manley Hopkins describing a world charged with the grandeur of God; or when I am moved by Rubens’ Descent From the Cross; I rather suspect I am affected because of, and not despite, the religious content of these works. So, onwards and upwards, as they say: Dante. Given its reputation, it’s a bit daunting, but there’s no point merely sticking in an apprehensive toe into the water: one just has to dive in, and hope for the best. And of course, one cannot read something like the Commedia without knowing the Bible. My own knowledge of the Bible has mostly been absorbed from secondary sources: until, say, a couple or so years ago, I had read very little of the Bible. Oh, of course, I paid lip service to it: it’s a pillar of Western civilisation; our entire culture, the norms of the society we live in, all flow from the book; the King James version is among the great literary miracles of the world; and so on, and so forth. It was far easier paying this lip service than actually reading the thing. So, after I finished my reading of all the Shakespeare plays about a couple of years ago, I decided that I really had to get to know the Bible at first hand. Since then, I have been reading through it, book by book (it’s not a volume that should be rushed through) – for, of course, the Bible is not a single book, but an entire library. And soon, I shall be tackling the Book of Psalms, which, a friend of mine (who I hope is reading this, and from whom I’ve nicked without permission quite a bit of the contents of this post – I’m sure he knows what I’m talking about) once described to me as “food for the soul”. 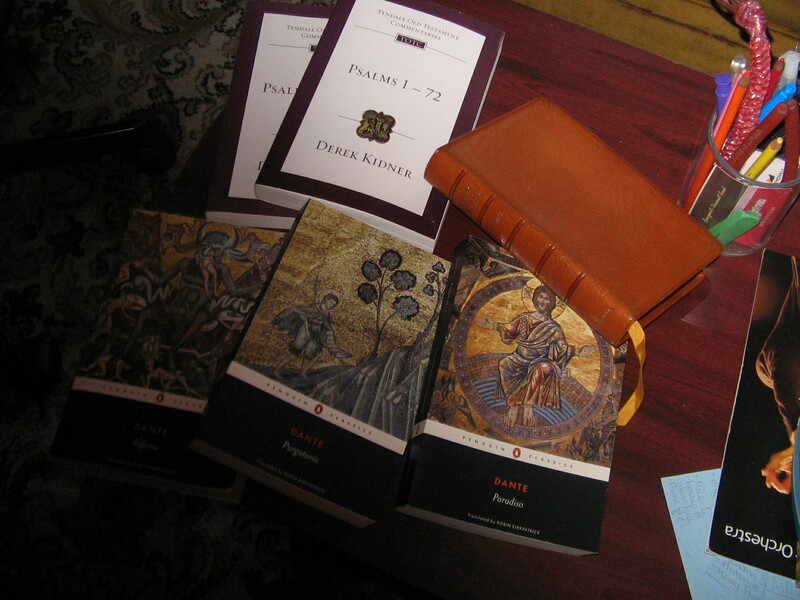 Well, in for a penny, in for a pound, as they say – not only will I be diving into Dante, I plan also to dive into the Book of Psalms, with the aid only of the renowned Tyndale Old Testament commentaries by Derek Kidner. And, depending on how my reading progresses, and how much I can take in, I hope to be reporting on those one hundred and fifty psalms, one by one, on this blog. For whoever may be interested. No more boasting like a fool – this deed I’ll do before the purpose cool.